Breathtakingly Beautiful!!!! 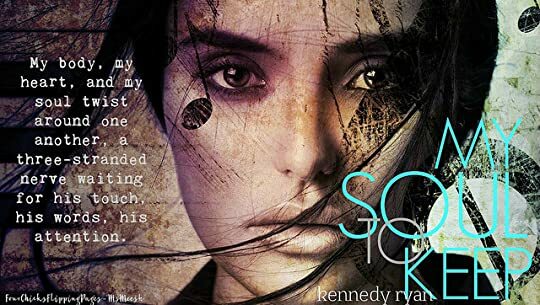 Kennedy Ryan has captured my heart, my attention and my soul as she delivers one of the most awe-inspiring, touching, emotional, and captivatingly raw story that I have read in her newest release, My Soul To Keep. With her gorgeous and beautiful prose, Ms. Ryan has delicately weaved a book layered with emotions, heart, beauty, and raw characters. In all honesty, My Soul To Keep is a book that you need to experience and savor. It is a book that cannot be reviewed properly because the story of Rhyson and Kai was so much more. There aren't enough eloquent words to describe the feelings that Ms. Ryan has bestowed and left her readers. I practically went into reading this book blind with no expectations and barely read the blurb. All I knew was the title and book cover alone captured my attention and I knew I had to read this book stat. My Soul To Keep is the first book that I have read from Kennedy Ryan and definitely won't be my last. What I can attest and say is that my heart is bursting with so much emotions. My Soul To Keep was brimming with so much passion, raw emotions, tangible connections and a palpable romance that will leave you begging for more. Ms. Ryan has orchestrated a story that tugged all the heartstrings. She beautifully weaved a story that incorporated music, love, and heart. As Ms. Ryan collides two stranger's hearts, she has perfectly created a song that will engulf our soul and leave us a beautiful mess. Two hearts, two songs, and two rhythms that beats as one. So if you love a book that is brimming with so much depth, beauty, and raw emotions, then I highly recommend you to read My Soul To Keep. Ms. Ryan will fill your heart with the lyrics of Rhyson and Kai.